There are few better ways to assess a Tour de France than an early team time trial and, after the crashes and chaos of the opening two days, stage three gave a glimpse of what may be to come over the next three weeks. Richie Porte's BMC edged out Team Sky for the stage win, while Nairo Quintana's Movistar lost ground, as the sprinters were sieved away and the general classification took shape. This was a positive day for Chris Froome as he earned back time lost in his stage-one crash, as well as an indication as to just how strong Porte's challenge could be once this race enters mountains, with such a reliable group surrounding the 33-year-old Australian - who himself played such an important role as domestique in Froome's early success. Froome's team-mate Geraint Thomas narrowly missed out on claiming the yellow jersey, clocking four seconds shy of Porte's American team BMC, who finished quickest over the 35.5km route around Cholet with a time of 38 minutes 50 seconds. Quick-Step Floors finished third (+7 seconds), Adam Yates's Mitchelton-Scott finished fourth (+ 9), while Tom Dumoulin's Team Sunweb finished fifth (+11). 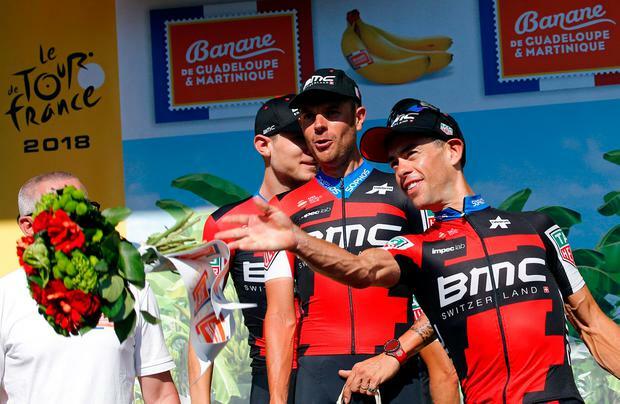 The result sent BMC's Belgian rider Greg van Avermaet into the overall race lead and the yellow jersey. Van Avermaet, who has Olympic road race gold and a Paris-Roubaix victory on his CV, and is named after the legendary Greg LeMond, wore the yellow jersey for three days during the 2016 edition and although he is unlikely to mount a challenge in the long-term, the make-up of the coming days offers him the chance to stay in yellow. Other riders suffered here, like French favourite Romain Bardet who lost significant time with Ag2r La Mondiale of more than a minute, and Movistar and Quintana who gave up 53 seconds. Ireland's Dan Martin also struggled after his UAE Team Emirates finished 15th on the stage, one minute and 38 seconds behind BMC. Team time trials test the both the strength and emotional harmony of a team, with the rules structured to prevent the strongest riders making a solo charge and forcing each squad to make difficult decisions over whether to leave team-mates behind, and there were indications of splits and frustrations in several groups.